In 1985, the Ohio government made Isotelus Ohio's official fossil. Isotelus is a trilobite that existed between 430 and 480 million years ago. At this point in time, an ocean covered much of what is now Ohio. Isotelus is evidence of this, as it was a marine organism. A trilobite was an invertebrate creature that had a hard outer shell or skeleton. 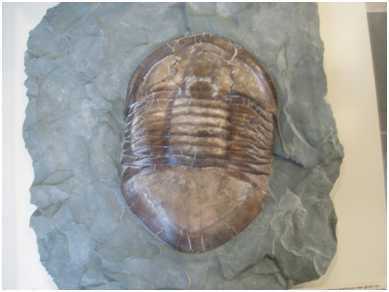 Two lines crossed the body of the trilobite, making it appear to be in three parts. Trilobite means "three-lobed creature." Isotelus primarily lived during the Ordovician Age. They were one of the largest trilobites, with some of these animals reaching nearly thirty inches in length. Isotelus no longer exist, becoming extinct approximately 430 million years ago.